She did not much like parties, Elizabeth said. Miss Kilman opened her mouth, slightly projected her chin, and swallowed down the last inches of the chocolate éclair, then wiped her fingers, and washed the tea round in her cup. Virginia Woolf's beautiful Mrs Dalloway is a powerful examination of the human psyche. The story is told through various streams of consciousness; we read each thought that passes through the characters' minds - the mundane, profound and everything in between. It's the small, everyday moments and insecurities in the novel that I find fascinating. We form an affinity with the characters as we join them on a hot June day; shopping, meeting old friends, throwing a party or, in the case of Miss Kilman above, 'necking' a chocolate éclair. I love French patisserie, but haven't ventured into baking it very often. However, I recently spent a truly lovely weekend in France with a group of friends; we rented a huge house in the Normandy countryside and spent three days making food, sitting in our enormous garden and drinking good wine. With 12 people in the house, I vowed to try a couple of French recipes that were new for me - including one I've been planning for a while (but have never had enough guests around to justify): a croquembouche. It was a hit - despite a good few hours of baking and a couple of caramel burns! And, pleasingly, I turned the leftovers into three delicious chocolate éclairs the next day. 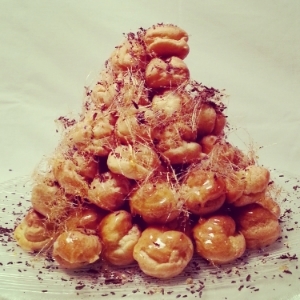 If you'd like to skip the croquembouche step and head straight for the éclairs, the recipe is below. 1. Preheat your oven to 180C. To make the pastry, place the butter and water in a large saucepan over a medium heat. Heat until the butter has melted and the water is simmering, then sieve the flour into the pan and beat the mixture together until it forms a thick paste. Continue to cook for a minute (which will ensure the pastry doesn't taste too floury) and set the pan aside to cool. 2. Add an egg to the cooled mixture, beating very well before adding the second egg. The dough should form a thick and glossy mixture that drops from a wooden spoon. Transfer the dough into one of the piping bags, and snip the end off to create a 1cm hole. Line the baking trays with greaseproof paper and flick some water onto the sheets. Pipe 10cm lines of the choux dough onto the paper (about 2cm wide), allowing space for the éclairs to double in size. 3. Bake the éclairs for 15 minutes, until risen and golden brown. Remove the tray from the oven, and poke a small hole in the end of each pastry with a small knife. Place the tray back in the oven for five minutes, to dry out the insides. Place the éclairs on a wire rack to cool. 4. While the éclairs are baking, you can start to prepare the crème pâtissière for the filling. Place the milk in a large saucepan with the split vanilla pod, and bring to a slow simmer over a medium heat. Whisk the egg yolks and sugar together in the mixing bowl until pale and creamy, and then mix in the flour. Slowly sieve the milk into the bowl, whisk thoroughly and pour the liquid back into the washed-out saucepan. 5. Cook the mixture over a low heat for around 7 minutes, stirring continuously, until thick and glossy. Cover with cling film, pressed right onto the surface of the crème pâtissière to prevent it forming a skin. Leave it to cool in the fridge. 6. Transfer the cooled crème pâtissière into the second piping bag and snip a small hole in the end. Fill each éclair through the hole in the end. 7. Finally, melt the chocolate over a bain-marie. Allow to cool a little and then dip each éclair, top side down, into the chocolate. Shake slightly to get rid of the excess chocolate and place on the wire rack until the chocolate sets. Serve with a cup of tea.